This is a guest post written by Adrian Brijbassi, an editor from the Toronto Star who write this article on his experiences when visiting Buffalo. You can find out more about Adrian on his website. 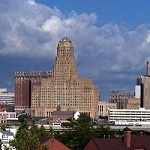 BUFFALO, N.Y. — “I’m a journalist and I’m writing a travel article about how to spend a weekend in Buffalo.” With those words, I had managed to disarm a U.S. border guard, a young man who immediately stepped back from my car and took a seat on the stool inside his booth. He placed a hand on his shaved head and then swiped it down across his perspiring face. “You’re going to say good things about the city, right?” he asked without any hint of authority. It was more of a plea. “I have every intention of being fair,” I answered.